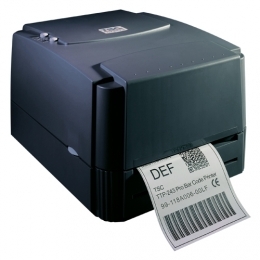 Hundreds of thousands of customers know the thermal transfer and direct thermal printers of the TTP-243 Series of TSC desktop printers are hard-wearing and robust. The main reason is the mechanism with the dual-motor print engine, which has already proven itself in other models. Thanks to their 32-bit high performance processor and the standard 4 MB Flash and 8 MB SDRAM, the series delivers quick, reliable processing of different labels with a maximum width of 114 mm. To expand the memory up to a maximum of 4 GB, simply use the optional SD card reader. The RS232 and USB interfaces, as well as the integrated printer languages TSPL and EPL guarantee easy integration into existing networks and structures. Upon request, you receive the printers of the TTP-243 Series with serial and parallel interfaces. Decide for yourself according to your requirements between the version with a resolution of 8 dots/mm 203 dpi and 12 dots/mm 300 dpi. Media change is easy - simply open the hinged cover and drop the roll into the tray.